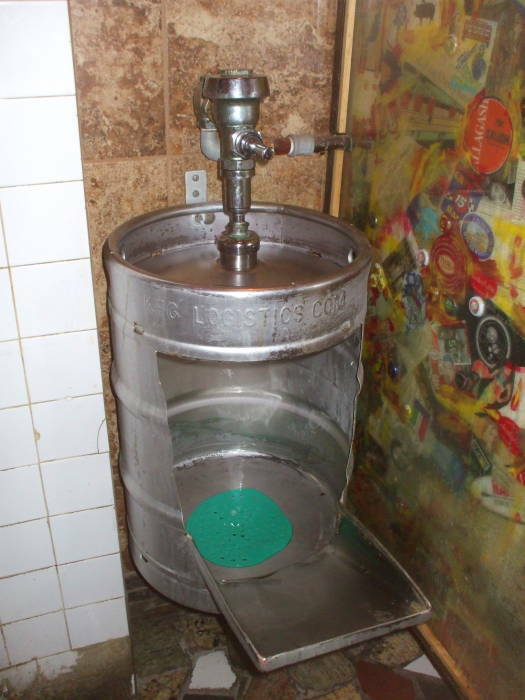 A urikeginal is a urinal fashioned from a beer keg. They are surprisingly rare, given how obvious this project this would seem to be. This example is in the Dive Bar at 732 Amsterdam Avenue at 96th Street on the Upper West Side of Manhattan in New York City. pH 7 is neutral, pH below 7 is acidic. By comparison, milk and saliva are typically around pH 6.3–6.6; black coffee is pH 5; grapefruit juice, tomato juice, and soft drinks are pH 2.5–3.5; and lemon juice and vinegar are around pH 2. Human urine is slightly acidic, typically in the range of pH 5.5–7 and averaging around pH 6.2. Urine contains urea (or H2N–CO–NH2) and other soluble waste products including inorganic salts and organic compounds. The urea and inorganic salts make urine corrosive to ordinary steel. The keg is from Keg Logistics. They make their kegs from stainless steel. Specifically, an austentic Cr-Ni stainless steel alloy which would also resist corrosion in this alternative application. It's designated as SAE/AISI 304, also known by DIN steel number 1.4301 and EN-standard X5CrNi18-10 or X2CrNi19-11. TIG welding can be used on stainless steel. TIG (or tungsten inert gas) welding uses a non-consumable tungsten electrode and a flow of an inert shielding gas such as argon or helium. The urikeginal was probably built using TIG welding.